Dr Payi Linda Ford is Aboriginal and identifies as Rak Mak Mak Marranunggu, from Kurrindju, on the Finniss River, in the Northern Territory and is currently a Principal Research Fellow at Northern Institute at CDU, with whom she has a long association. Her knowledge, expertise and research in working with Indigenous groups is clearly invaluable to the Northern Institute. Dr Ford graduated with her PhD (Education), 2006 from Deakin University. Linda understands and is familiar with Indigenous epistemological practices and its application to her research projects. Her knowledge and experience has informed her research practises to include ways of being, knowing and ability to lead and contribute to local, national and international research projects. The Indigenist research methodologies are applied to her research projects ie. Australian Research Council Projects, FRDC Aquaculture project and Plant Biosecurity research project. Current projects include 2 ARC's PBCRC 4041, LEBA Grants (Ageing, Telehealth and Language revitalisation), NTG Oral History grant. Payi has also been educated in mainstream Australian education institution. Payi’s mainstream education has involved a number of schools and universities in various Australian locations. This educational background has given Payi a substantial depth to her understanding of education across both Indigenous and non-Indigenous traditions. 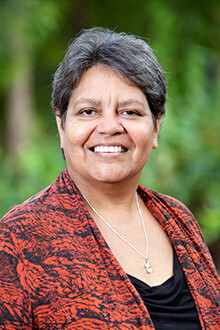 Payi has also reached the high point of Western education with a Ph.D. Before joining Northern Institute Payi worked as a senior lecturer with the Aboriginal and Torres Strait Islander Unit at the University of Queensland. New Ways for Old Ceremonies: An Archival Research Project. ARC Discovery Indigenous Project (IN150100013). Aboriginal Cosmology: What This Means for Women and Gender Public Policy. ARC Discovery Indigenous Programme (IN170100020). Building Resilience in Indigenous Communities through Engagement: A Focus on Biosecurity Threats. Plant Biosecurity Cooperative Research Centre (PBCRC4041). A History of Aboriginal Land Use of the Delissaville, Wagait and Larrakia Aboriginal Land Trust. NT Dept of Arts and Museums. National Indigenous Research and Knowledges Network (NIRAKN). ARC Special Research Initiative for an Aboriginal and Torres Strait Islander Researchers’ Network. Rose, D., D’Amico, S., Daiyi, N., Daiyi, M., Deveraux, K., Ford, L., & Bright, A. (2011). Country of the Heart – An Indigenous Homeland (Second Edition). Canberra, ACT: Aboriginal Studies Press, AIATSIS. Ford, P. L. (2010). Aboriginal Knowledge & Country: marri kunkimba putj putj marrideyan. Brisbane, QLD: Post Pressed. Rose, D., D’Amico, S., Daiyi, N., Daiyi, M., Deveraux, K., Ford, L., & Bright, A. (2002). Country of the Heart – An Indigenous Homeland, Canberra, ACT: Aboriginal Studies Press, AIATSIS. Murray, F., Ford, L., & Deveraux, K. (1994). Teaching and learning an Aboriginal Language: Mak Mak Marranunggu, Curriculum and Assessment. Darwin, NT: Northern Territory Department of Education. Ford, LP., L, Barwick, L., Marett, A.. (2014). Caring about ceremony: Indigenous knowledge across boundaries of time, space and society. In K. Barney (ed. ), Collaborative Ethnomusicology: New Approaches to Music Research between Indigenous and Non-Indigenous Australians. Melbourne: Lyrebird Press. Mackaway, J., Winchester-Seeto, T., Peach, D., Ferns, S., Campbell, M., Moore, K., Wallace, R., Ford, L., & Prior., J., Inclusive practice in WIL. In S. Ferns (ed. ), Work integrated learning in the curriculum, HERDSA guide. Milperra, NSW: HERDSA. Ford, L., Arnott, A., Prior, J., & Nasir, T. (2014). Incorporating Indigenous Knowledge into the CDU Bachelor of Education (Pre-service) Primary. International Journal of Diversity in Organisations, Communities and Nations. Dunbar, T., & Ford, L. (2010) New Life: Conception, Pregnancy and Birthing. In R. Thackrah (ed. ), Indigenous Australian Health and Cultures: An introduction for health professionals. Curtin University of Technology, WA: Pearson’s Education Australia Publishing Company. Kessaris, T., & Ford, L. (2007). Tyikim/Blekbala Perspectives on Languages. In G. Lietner & I. Malcom (eds. ), The Habitat of Australia’s Aboriginal Languages – Past , Present and Future (Trends in Linguistics Studies and Monographs 179) (pp. 355-370). Berlin: Mouton de Gruyter. Rose, D., Daiyi, N., & Ford, L. (1995). The Way We Are (Working in Flux). In E. Greenwood, K. Neuman & A. Satori (eds. ), Work in Flux: Part One: ‘Scholarship and Indigenous Knowledge’ (pp.5 – 10). Melbourne, VIC: The University of Melbourne. Ford, L. (1994). Thinking Work: ‘Rethinking Watjpella Way in literacy Education. In P. O’Connor (ed. ), Volume 1: Theoretical Perspectives on Workers’ Literacies (pp.161 – 175). Adult Literacy and Basic Skills Action Coalition (ALBSAC). Ford, L. (1993). Teaching Aboriginal Learners with Hearing Difficulties and Special Communication Needs. In Ngoonjook: A journal of Australian Indigenous Issues (Edition 8, pp.14 – 20). Batchelor, NT: Batchelor College. Ford, L. (1992). Social and Cultural Education: Intercultural Patterns. In F. Murray, L. Ford & K. Deveraux (eds. ), Teaching and learning an Aboriginal Language: Mak Mak Marranunggu, Curriculum and Assessment. Darwin, NT: Northern Territory Department of Education. Prior, J., Fleming, A., & Ford, L. (2014). Goulburn Island Indigenous Aquaculture Enterprise Program. Indigenous Science Network Bulletin, 17(2). Ford, L., Arnott, A.R., Nasir, T., & Prior, J. (2014). Incorporating Indigenous Knowledge into the Bachelor of Education (Pre-service) Primary. International Journal of Diversity in Organisations, Communities and Nations, 13(1), 35-48. Rose, D., Daiyi, N., & Ford, L. (2002) Life in Country: Ecological Restoration on Aboriginal Homelands. Cultural Survival Quarterly, Issue 26.2 [Nurturing the Sacred in Aboriginal Australia]. Ford, L. (1997). An Indigenous Perspective on Intellectual Property. The Aboriginal Law Bulletin, 3(90), 13. Ford, L, Fleming, A., Manmurlulu, R., & Inmulugulu, J. (March 2014). History of Warruwi’s Culture in the Aquaculture Development Project. Paper presented at AIATSIS National Conference: BARRIERS In Indigenous Research and Thinking, Canberra ACT. Ford, L., & Barwick, L. (March 2014). Caring about ceremony: Indigenous knowledge across boundaries of time, space or society. Paper presented at AIATSIS National Conference: BREAKING BARRIERS In Indigenous Research and Thinking, Canberra ACT. Ford, L., & Prior, J. (March 2014). Incorporating Indigenous Knowledge into the CDU Bachelor of Education (Pre-service) Primary. Paper presented at AIATSIS National Conference: BREAKING BARRIERS In Indigenous Research and Thinking, Canberra ACT. Ford, L., & Prior, J. (2014). Incorporating Indigenous Knowledge into the CDU Bachelor of Education (Pre-service) Primary, Poster in AIATSIS National Conference Proceedings, March. Christie, M., Ford, L., Campbell, M., Spencer, M., Bow, C., Prior, J., Nasir, T., & Verran, H. (2014). Research into Indigenous Governance and Governmentalities. CRN Northern Australian Development Conference ‘A Northern Perspective', 25th -26th November 2014. Ford, L. (2010). Understanding home language varieties among young Indigenous children in north Australia. The Early Childhood Australia National Conference, ‘Garla Bauondi: Fuelling the fire’, Adelaide, 29 September-2 October, 2010. Ford, L., Guthadjaka, K., Whitburn, K., Lawurrpa, E., Liddy, M., Bangguna, M., Puruntatameri, T., & Atie, Y. (2009). We look after our little ones as Aboriginal Early Childhood Practitioners. AIATSIS conference ‘Perspectives on Urban Life’, 28th – 3rd October 2009. Ford, L. (2002). Comments. In D. Rose, (ed. ), Country in Flames: Proceedings of the 1994 Symposium on Biodiversity and Fire in North Australia (pp. 67-110). Canberra, ACT & Darwin, NT: Department of the Environment, Sport & Territories & the North Australia Research Unit, The Australian National University. Ford, L., Gould, J., Inmulugulu, J., Galaminda, G., Golder, B., Ngalmindjalmag, N., Ford, E., & Dhamarrandji, R. (2014). Warruwi’s Fisheries & Aquaculture Knowledge Project webpage, sponsored by Fisheries Research and Development Council. Ford, L. (2011). DVD Looking after our Little Ones. Australian Research Council grant. Ford, L. (2011). DVD Tiwi & Palmerston Developmental Milestones, Darwin. Australian Red Cross project. Kurranama, R., Mayayanga, M., Gumurdul, R., Magalgala, M., Ford, L., Fleming, A, Van Weerin, T., Manmurulu, J., Inmulugulu, J., Galaminda, G., Golder, B., Ngalmindjalmag, N., Manmurulu, D., & Manmurulu, R. (2013). Developed Poster: Warruwi’s Seasonal Chart for Yagbani Aboriginal Corporation. 2015 - Winner of the Vice-Chancellor's Award For Exceptional Performance in Research. 2015 - Won the Caring for Country NAIDOC Award.